Are you as excited in anticipation of 🍀St. Patricks' Day as we are? Well, this year, children have decided that they will not be setting up a trap for Leprechauns, but rather they want to create a peaceful and inviting atmosphere. "He earned his gold by working hard making shoes for fairies, so why should we catch him to take from him what is rightfully his?" they said. So, with Daddy's help, children made a Leprechaun village using all natural materials and treasures we have found during our nature walks like moss, stone, glass, and bark. Combine all the ingredients in a saucepan. Stir well and cook over medium heat until dough forms into a ball, which will happen very quickly, so watch out ( I would say a minute or so.) Remove from heat and allow to cool down. If you would like a no-cook recipe, see here how we made No-Cook Homemade 🌈 Play Dough. Have your child enjoy the sensory play! Knead, squish, smash, twist, pull! 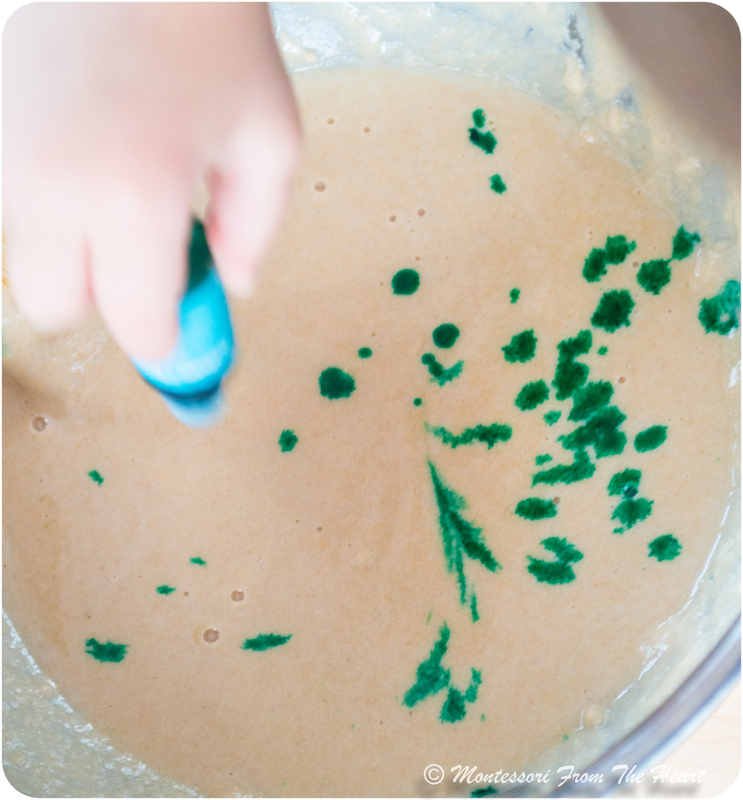 As your child manipulates and molds playdough, they are doing much more than just having fun. Just the basic act of playing with playdough builds those little hand's muscles, developing gross motor control. Playdough is about exploring using the tactile sensory system: from textures to consistencies, playdough is all about hands-on exploration! Invite your child to "write" a message while exercising fine motor skills and spelling. Adrian wrote: "Adrian ❤️️Love❤️️ Julia." Glittery playdough was perfect to track those little footsteps. This Small World invitation to create and play, besides spurring creativity, also triggers imaginative skills allowing a child to express thoughts and experiences commonly dealt with through play. Small world is a very important part of child's play, promoting many areas of child's development, such as affording an opportunity to build language skills, expanding vocabulary during role play, advancing problem-solving skills and instilling independence as the child "creates" the small world set up. When children engage in the small world play, they act out roles and scenarios many of which they have experienced firsthand by observing family members or friends. These play scenarios provide opportunities for children to imitate everyday life and cultural background and learn more about the world around them. 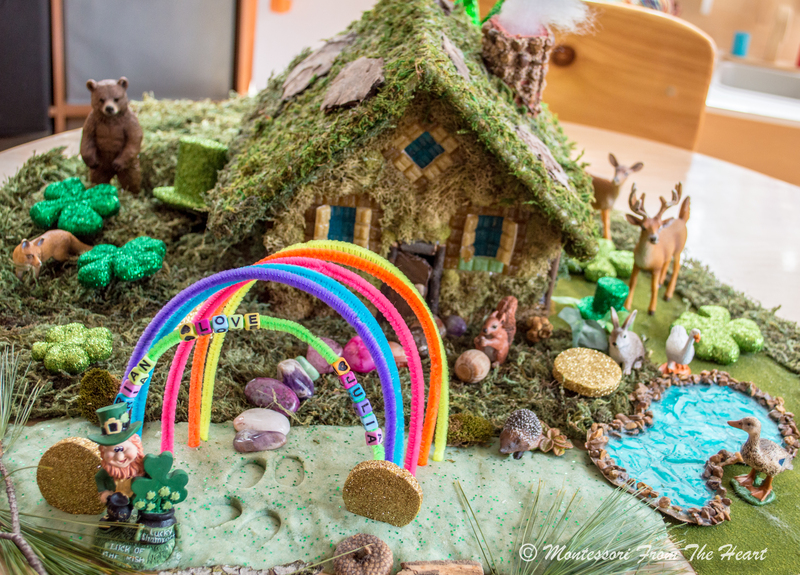 By setting up a forest fairytale small world play, for example, you can discuss the real forest: its ecosystem, as well as what type of animals reside in a particular area and how is everything interconnected. Leprechauns are miniature magical creatures originated from Irish folklore. As big as a thumb, they are remembered on St. Patrick's Day, and Old Irish word Luchorpan means wee one. Mischievous but hard-working, Leprechauns earn their gold by making shoes for fairies. They live long lives: 200 years is not even considered of age, and they like nuts and dandelion tea. You can only catch a Leprechaun if you happen to have in a possession a very hard to find four-leafed clover. And if you are lucky enough to ever catch a Leprechaun, he will grant you three wishes or might even pay you for his freedom with a pot of gold hidden behind the rainbow. "Thanks for stopping by, little Leprechaun! We hope your gold is safe at the end of the 🌈 rainbow!" Are you excitedly anticipating☘️ St. Patrick's Day? Will you be trying to catch a Leprechaun? Do you think any of your perfect traps would work? Well, a legend says that you can catch a Leprechaun only if you have 🍀a four-leafed clover! Do you know the difference between a shamrock and a clover? ☘️A shamrock (a symbol of Ireland and St. Patrick's Day) is a young spring of white clover that grows during winter in Ireland. The word shamrock comes from the Irish word ‘Seamrog’ meaning little clover or young clover. The plant never flowers, and if planted outside of Ireland it will wither and die. Usually, the shamrock has three leaves, which stand for faith, hope, and love. The shamrock is associated with Ireland because Saint Patrick, Ireland’s patron saint, have used the plant as a metaphor for the Holy Trinity of the father, the son and the holy spirit. 🍀 The four-leafed clover or “lucky clover” is very difficult to find since it is an uncommon variation of the three-leafed clover. A four-leaf clover is meant to represent God’s Grace and is considered to be a symbol of good luck. Have you been lucky? For more on St. Patrick's day hands-on fun, see here ☘️St. Patrick's Day Kids Activities. p.s I wrote in details about benefits of Small World and Pretend Play here in a post "🍂Fall-Inspired SMALL WORLD PLAY ♻️ Green Doll 🏡 House."